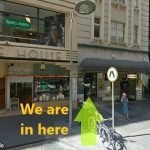 How to find us: We are situated on Little Collins Street. Between Elizabeth and Swanston street. It is a small white building next to Yule House. Entrance is on the left hand side of Mountford shoes. Please take the lift to level 3. Entrance Located left of Mount ford shoe store.